Though a separate municipal concern, the Canadian city of Mississauga has long had to exist within the shadow of its larger neighbour Toronto and has since been absorbed into its metropolitan sprawl. It is content to regard itself as part of the Greater Toronto Area however, one of the fastest-growing regions of North America with five million inhabitants, of which 700,000 reside in Mississauga itself. Where the city is able to assert itself in regional politics is through its mayor, ‘Hurricane’ Hazel McCallion, who has won every mayoral election contested since 1978. Even at 84 years old she shows little sign of withdrawing from Canadian politics, gaining re-election in 2003 and receiving the Order of Canada in 2005 as well as being runner-up in World Mayor 2005. She is the longest serving mayor in Canada and has kept the city debt-free since her first term of office. Mississauga’s city council comprises the mayor and nine city councillors. It sits within the Peel Regional Municipality of Ontario, the county authority covering the suburbs of Toronto, which provides a range of strategic-level services across the towns and cities under it. In its history since incorporation as a city in 1974, there have only been three mayors elected in Mississauga, the first two serving only one term each before McCallion secured election in 1978. Urban sprawl across the ever expanding Greater Toronto Area has proven to be a point of contention in the mayor’s record and something she had publicly acknowledged failing to prevent during her tenure, despite recent attempts to provide a solution. McCallion began her political career in 1968 on the Streetsville municipality, a village body later absorbed into Mississauga under the new city guise in 1974. 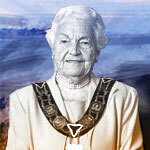 After becoming Chairman of the Planning Board, she progressed to become deputy reeve, then reeve and then mayor of Streetsville, until its incorporation into Mississauga. Successfully gaining election to the new Mississauga city council and the Peel Regional Municipality, it was not long before she secured the mayoralty of the city, where she has remained since. Her reputation over the past quarter century has hinged on her financial acumen and political pragmatism, with her no-nonsense style endearing her to constituents and alienating some opponents. In addition to her enviable achievement of keeping the city debt-free throughout her tenure as mayor, in 1991 she became the first mayor to submit their city’s budget to public participation. Her various appointments at city, regional and national level since 1978 are too numerous to list, though her international honours include Germany’s Cross of the Order of Merit in recognition of her role in Canadian-German trade affairs. Politically McCallion can be regarded as a conservative but has criticised the federal leadership of the Conservative Party of Canada in recent years over its attitude towards city governments. The issue of dense urban sprawl and unrestricted growth across the region has led some in Mississauga to ponder a move towards unitary city status, therefore seceding from the Peel Regional Municipality. McCallion and others have tabled motions to this effect but the decision ultimately resides with the state legislature. Opposition to the concept has been mounted by politicians in the regional capital of Brampton, who then have to contemplate similar moves. The regional authority exercises control of local policing, environmental affairs, social housing, planning and healthcare. The Greater Toronto Area Mayors’ Committee, founded by McCallion herself in 1992, brings together the region’s 30 mayors and the four regional municipality chairs in one co-ordinating body. The city of Mississauga is twinned with Kariya city in the Aichi prefecture of Japan. Mayor McCallion’s husband Sam died in 1997. She has three children and a grandchild. Home to almost 700,000 residents, Mississauga is Canada’s sixth-largest city. Located at the western end of Lake Ontario in the Greater Toronto Area (GTA), Mississauga adjoins the towns and cities of Toronto, Brampton, Milton and Oakville and covers an area of approximately 288 km2. The name “Mississauga” means “river of the north of many mouths”. Originally settled by the Mississauga Indians in the 1600s, the story of Mississauga began when European explorers discovered the Mississaugas living around the Credit River. Explorers referred to the land where the Mississaugas lived as the “Mississauga Tract”. The City emerged when government officials from York, as the City of Toronto was then called, purchased this land from the Mississauga Indians, naming it Toronto Township. In 1908, the communities of Dixie, Clarkson, Cooksville, Malton, Erindale and Meadowvale Village joined together to form the Town of Mississauga. 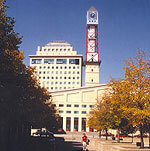 In 1974, with the inclusion of the villages of Port Credit and Streetsville, Mississauga was incorporated as a city. Today, the City of Mississauga is home to Pearson International Airport, the busiest airport in Canada, and functions as the gateway to Canada for international travellers and business people alike. The City houses over 49,000 businesses, including 57 Fortune 500 head offices, and employs over 410,000 people who contribute to economic activities of various industries, such as motor vehicle manufacturing, pharmaceuticals, construction materials and household appliances. Mississauga is quickly becoming a key player in the global economy, with the third largest finance, insurance and real estate (FIRE) sector in Canada, and one of Canada’s largest and most concentrated information and communications technologies (ICT) clusters. Recognized as being the safest city in Canada for the fifth year in a row, Mississauga is rich in arts, cultural facilities, parks, entertainment, nightlife and world-class sport and recreational facilities, including Square One, Ontario’s largest shopping centre, over 481 parks and woodlands and world-class art and theatre venues.